ViewSonic is the leading manufacturer of a broad variety of products such as LED monitors, large-format displays, touch displays, virtual desktops and projectors. It is one of the latest display manufacturers that have added FreeSync to their range. Its XG2401 gaming monitor is said to be one of the best FreeSync gaming monitors in terms of affordability and performance. Here is a complete review of the ViewSonic XG2401 24″ gaming monitor. 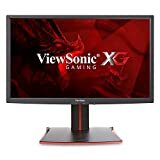 The ViewSonic XG2401 is a 24″ gaming monitor with a resolution of 1920×1080 pixels. The overall body is coated plainly in matte black, but it possesses red stripes in the middle of the front and back side of its stand as well as on the edges of the base, just like every gaming monitor. Due to its matte finish, it doesn’t exhibit fingerprints or much dust. There is a tiny hook at the top side of the stand that allows users to dock their headphones, whereas a circular ring at the bottom side lets users coil all the cluster of wires they have connected to the monitor. Moreover, this monitor is extremely adjustable. You can raise, lower, and tilt the screen forward and backward according to your requirements. This gaming monitor can also be used in portrait mode as it can be swiveled up to 90 degrees. Moreover, its interface is pretty straightforward and easy to navigate. It possesses a dedicated button that allows users to switch video sources with only one click. There’s another button for activating one of the several genre-specific gaming modes of this monitor. Also, by tapping the button called 1, you can easily tweak color and audio and can activate advanced functions such as low input lag and FreeSync. This device is also VESA-mountable, which means you can easily attach it to your wall. Apart from that, it comes with a built-in speaker, two USB 3.0 ports, one USB 2.0 type B port, and DisplayPort. Its accessories include an IEC cord, a 3.5mm audio jack, a DisplayPort cable, a USB 3.0 cable, and CD-ROM drivers. The XG2401 is a fantastic gaming monitor that delivers incredible performance. It offers a quick refresh rate of 144Hz that makes all events such as shooting off your enemies and ducking to save yourself incredibly instant. Its FPS1 mode provides users with a dull color picture to help prevent eyestrain, while the FPS2 mode offers an extra-high contrast so that players can easily spot enemies. It provides users with a fantastic image quality. It excellently highlights flowing rivers, lush forests, colorful characters, and every detail of the game for keeping the player’s interest high and allowing them to keep up with the action. Moreover, the input lag is perfect for playing fighting games as they permit users to pull off combos that require frame-perfect timings. Fast refresh rate and response time. Adjustable stand and display screen. The performance of built-in speakers is not up to the mark. The ViewSonic XG2401 has a 144hz refresh rate, making it an extremely good gaming monitor. The ultra-fast response rate of 1ms only adds to its capabilities and the 24″ crystal clear display just makes it an ideal monitor for any gamer.